We may as well be honest: this hike is not for everyone. The itinerary includes some challenging stretches, and though there are only a few, it's better to be safe than sorry. If you are a beginning hiker or suffer from a fear of heights or vertigo, it may be best to stick to one of the island's many trails that are less rigorous. This was originally a trail used by local hunters to reach Mount Solaro; though there are some hunters who still use it, you will mostly encounter fellow expert hikers who are looking forward to their just reward of an amazing view from the peak. The trail begins near the Capri hospital, first as a lane but quickly becoming a steep footpath up the slope of hulking Mount Solaro, the profile of which reminds you of how much you still have to climb! 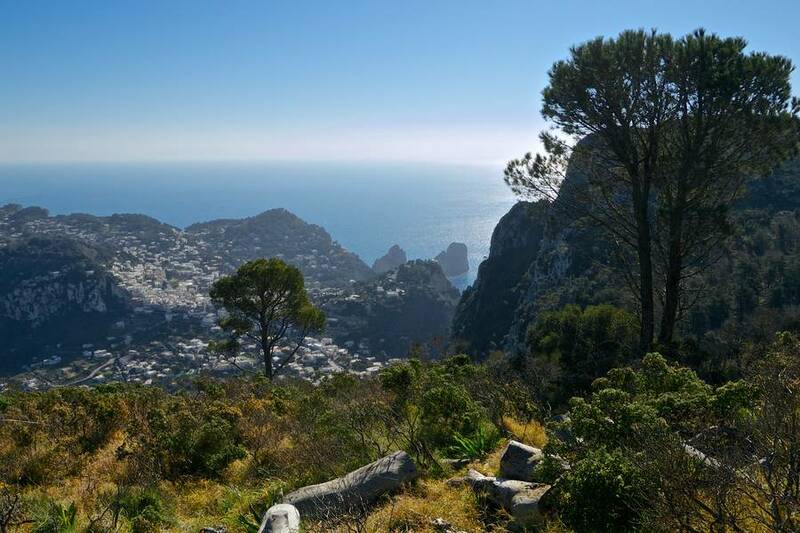 During the climb, the center of Capri recedes into the distance and once you have reached the summit, seems so remote that you feel as if you should plant a flag at the top of the mountain like an alpine explorer! This hike is memorable for the views along the way and the 360° panorama over the island and Mediterranean from the top which cannot be matched from any other point on the island. Duration: from the Piazzetta, it will take at least 2 hours to reach the summit of Mount Solaro keeping a steady but slow pace. However, consider that it will take another 3 hours to continue along the trail and return to Anacapri at the foot of the mountain. Do not attempt this trail alone, but instead hire a hiking guide who knows the route and terrain well. There are hiking guides and associations on the island which offer these services. This trail is best hiked uphill, with a stop at the top to admire the beauty of Mount Solaro, and a descent through the valley of Cetrella to Anacapri on the other side. From Anacapri, you can return to Capri by bus (or by foot, if you feel up to it! ).